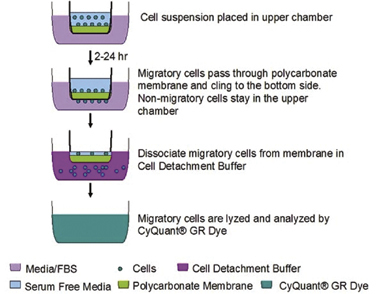 5 µm Chemotaxis Assays, 24-Well Format | Cell Biolabs, Inc.
Stranahan, A.M. et al. (2016). Blood-brain barrier breakdown promotes macrophage infiltration and cognitive impairment in leptin receptor-deficient mice. J. Cereb. Blood Flow Metab. 36:2108-2121. Yu, Y. et al. (2016). Mesenchymal stem cells with Sirt1 overexpression suppress breast tumor growth via chemokine-dependent natural killer cells recruitment. Sci. Rep. 6:35998. Lei, D. et al. (2016). Lentiviral delivery of small hairpin RNA targeting connective tissue growth factor blocks profibrotic signaling in Tenon's capsule fibroblasts. Invest Ophthalmol Vis Sci. 57:5171-5180. Du, W. et al. (2016). Age-associated vascular inflammation promotes monocytosis during atherogenesis. Aging Cell. doi:10.1111/acel.12488. Deng, B., & Feng. Y. (2015). TIPE2 mediates the suppressive effects of Shikonin on MMP13 in osteosarcoma cells. Cell Physiol Biochem. 37:2434-2443. Choi, B. et al. (2015). Cytosolic Hsp60 orchestrates the survival and inflammatory responses of vascular smooth muscle cells in injured aortic vessels. Cardiovasc Res. doi: http://dx.doi.org/10.1093/cvr/cvv130. Sa, Y. et al. (2015). TIMP-1 induces α-smooth muscle actin in fibroblasts to promote urethral scar formation. Cell Physiol Biochem. 35:2233-2243. Wu, W. et al. (2015). FBXL5 inhibits metastasis of gastric cancer through suppressing Snail1. Cell Physiol Biochem. 35:1764-1772. Liu, X. et al. (2015). MicroRNA-10b downregulation mediates acute rejection of renal allografts by derepressing BCL2L11. Exp Cell Res. doi: 10.1016/j.yexcr.2015.01.018. Lee, Y. H. et al. (2014). Stretch-induced human myometrial cytokines enhance immune cell recruitment via endothelial activation. Cell Mol Immunol. doi: 10.1038/cmi.2014.39. Cizkova, D. et al. (2014). Modulation properties of factors released by bone marrow stromal cells on activated microglia: an in vitro study. Sci Rep. 4:7514. Jelacic, T.M., et al. (2014). Exposure to Bacillus anthracis capsule results in suppression of human monocyte-derived dendritic cells. Infect Immun. 82:3405-3416. Kiss, J. et al. (2012).Loss of the Oxygen Sensor PHD3 Enhances the Innate Immune Response to Abdominal Sepsis. J. Immunol. 189:1955-1965 (#CBA-102). Rayner, K. et al. (2008). Extracellular Release of the Atheroprotective Heat Shock Protein 27 is Mediated by Estrogen and Completely Inhibits acLDL Binding to Scavenger Receptor-A. Circ. Res. 103(2):133-141 (#CBA-102). Shynlova, O. et al. (2008). Monocyte Chemoattractant Protein-1 (CCL-2) Integrates Mechanical and Endocrine Signals that Mediate Term and Preterm Labor. J. Immunol. 181:1470-1479 (#CBA-102).